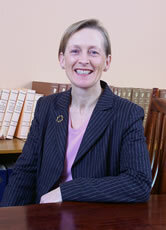 VERONICA ANN (RHONA) KELLY is an experienced solicitor with 35 years of experience. As a trained marriage counsellor and accredited practitioner mediator of the Mediators' Institute Ireland, she has good listening and communication skills which enhance her Family Law practice. Rhona is also a trained collaborative family lawyer. She has wide experience of separation and divorce applications and related matters including guardianship, access and domestic violence issues. She is a member of the Family Lawyers' Association, the Association of Collaborative Practitioners and the Mediators' Institute Ireland. Rhona is also experienced in Litigation dealing with a range of issues from personal injuries/accident claims to debt collection in the District, Circuit and High Courts, employment matters, damage to property and breach of contract. She has certified professional training in Advanced Advocacy Skills from the Law Society of Ireland and the National Institute for Trial Advocacy (USA). Rhona provides a confidential, sensitive and practical approach to clients in dealing with Probate matters including making a Will or dealing with the estate where someone close to you has died. Rhona is currently pursuing an MSc in Management and Corporate Governance at the University of Ulster which she hopes to complete in June 2012 and she will have a postgraduate Diploma in September 2011. She is a member of the Institute of Chartered Secretaries and Administrators and will achieve GradICSA status in September 2011. Rhona can advise on matters related to Company Law. She can assist companies, their directors, secretaries and managers to comply with their statutory obligations by providing technical and practical advice and assistance, particularly with regard to statutory responsibilities and obligations of directors and other officers.